Rated Black Entertainment Network and BET Jazz’s #1 show in the United States! Have you ever wondered how musicians create an album? Studio Jams is a collection of live studio sessions that gives us a peek into the creative process of developing and “cutting” a record. Each episode allows the viewers a “behind the scenes” pass with many of the world’s greatest musicians. In addition to the technical aspect of creating the album, Studio Jams highlights the artists’ struggles and drama of both their personal and professional experiences. Each musician has his or her own musical taste that also plays a part in to the artistic process and defines each episodes approach. Come inside the recording studio…let’s jam and create some fresh new music! 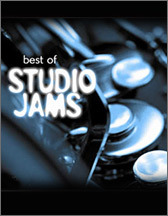 Read more about Studio Jams here.